Grief can make you do crazy, unexplainable things. This story tells us about Corrie Saunders after the death of her husband. We see her journey to acceptance of Jarrod’s forever absence, and back to the One who loves her no matter what. I found the “ghosts” to be a little creepy, but completely realistic. Tracey Bateman handled a touchy subject with a lot of grace and well-written words. 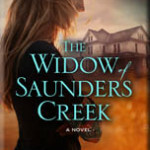 I highly recommend The Widow of Saunders Creek if you like suspense with a touch of romance. Corrie Saunders grew up in a life of privilege. But she gave it all up for Jarrod, her Army husband, a man she knew was a hero when she vowed to spend her life with him. She just didn’t expect her hero to sacrifice his life taking on an Iraqi suicide bomber. 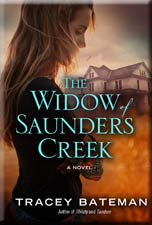 Six months after Jarrod’s death, Corrie retreats to the family home her husband inherited deep in the Missouri Ozarks. She doesn’t know how to live without Jarrod—she doesn’t want to. By moving to Saunders Creek and living in a house beloved by him, she hopes that somehow her Jarrod will come back to her. Something about the house suggests maybe he has. Corrie begins to wonder if she can feel Jarrod’s presence. Jarrod’s cousin Eli is helping Corrie with the house’s restoration and he knows that his dead cousin is not what Corrie senses. Eli, as a believing man and at odds with his mystically-oriented family members, thinks friendly visits from beyond are hogwash. But he takes spirits with dark intentions seriously. Can he convince Corrie that letting go of Jarrod will lead to finding her footing again— and to the One she can truly put her faith into? Visit Amazon to purchase this book and help support this blog.